Batfish (Platax Orbicularis) Photo by Ilse Reijs & Jan Noud HuttenThis dive site is one of Phi Phi’s most popular, even for those travelling from Koh Lanta on a day trip or diving liveaboard. It’s a simple dive site, allowing for both Divemasters and their groups to relax and focus on the marine life, rather than worry too much about getting lost, separated or caught in a current. There’s nearly always something to talk about after the dive, and it’s usually a shark or turtle sighting, but sometimes something more special. The general diving conditions enable divers of all levels to enjoy an interesting yet easy dive. It’s not too deep, the visibility is usually good and the topography is simple to stay together but interesting and filled with life. It’s a perfect dive site to finish one’s Open Water Course on, and it’s even possible to take part in a Discover Scuba Diving dive, for those who have never tried scuba diving before. Experienced and even professional divers are likely to enjoy a dive here, as it’s easy enough for them to slowly explore all the little nooks and crannies for smaller and special creatures, including seahorses. 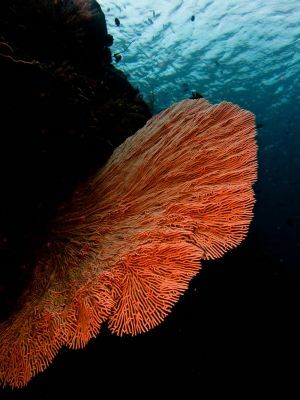 Gorgonian Sea Fan Photo by Ilse Reijs & Jan Noud HuttenStarting with the location and topography of Palong Wall, it’s a simple wall which is almost vertical as it meets the surface of the sea and gently spreads out until it becomes the seabed at a depth approaching 20 metres. There are thousands of holes and crevices for creatures of all shapes and sizes to use for shelter, nesting and feeding. There are even a few swimthroughs, which are very easy to negotiate. It’s located on the western side of Koh Phi Phi Lei (pron. ko pee pee lay) and some refer to it as a two-way dive site, including Maya Wall, as it can be dived one way or the other from the common starting point, depending on the day’s currents. In truth, Maya Wall is a different dive site which is more often started just inside Maya Bay and divers descend and exit the bay at the same time, returning to the surface out on the wall, not far from where Palong Wall dive site starts. 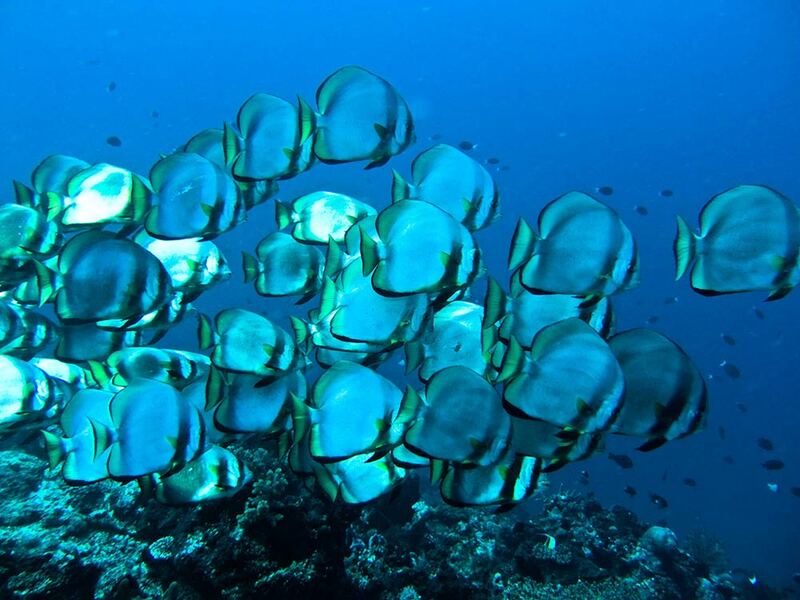 Diving at Palong Wall is easy enough for experienced divers, who can therefore take their time and explore the wall and corals for marine life which is often missed when passed quickly. Novice and learning divers can enjoy the reef and its life while following the instructions and lead of their PADI dive instructor. Certified PADI divers who lack experience will find that Palong Wall is the perfect place to practise. It’s easy to navigate, but exciting and has lots of life. 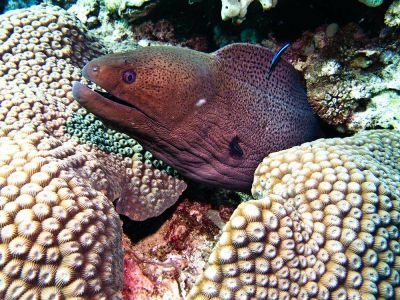 Giant Moray Eel (Gymnothorax Javanicus) Photo by Ilse Reijs & Jan Noud HuttenThe commonly-seen marine life at Palong Wall comes in all forms. The corals and sea fans are large, healthy and colourful, including some good-size Gorgonian Sea Fans. There are plenty of ‘critters’ including crabs, shrimps and lobsters, but these tend to hide in holes and under rocks during the day, making it difficult to see all of any one specimen. As already mentioned, there is a good chance of seeing a shark, with Leopard Sharks (Stegostoma fasciatum) being the most commonly seen. They are docile, harmless and nocturnal sharks which feed on bottom-dwelling crustaceans at night, spending their days trying to rest on the bottom. Seeing one swimming in the day is usually a result of divers from another group having disturbed it. 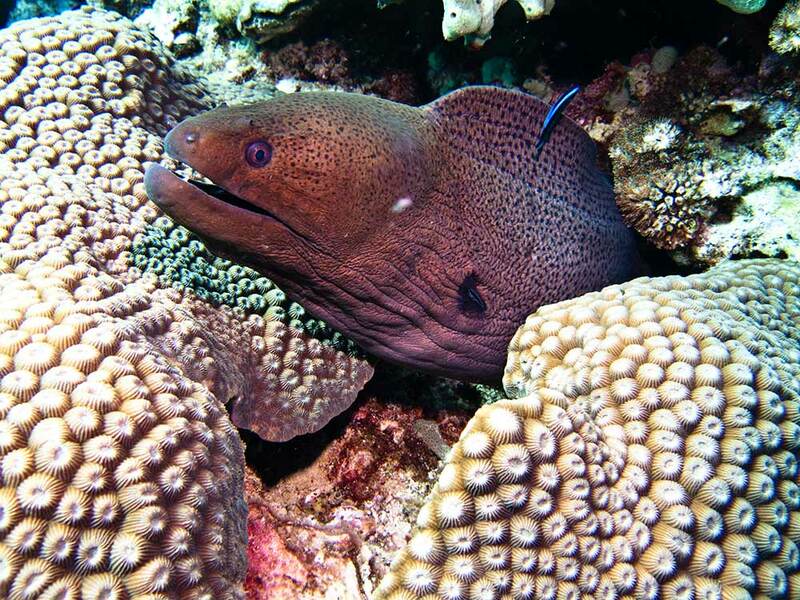 Other interesting and not-so-small creatures here at Palong Wall are Moray Eels, particularly the Giant Moray Eel (Gymnothorax javanicus). They spend their days poking their heads out of whichever hole or crevice they have made their temporary home, opening and closing their mouths to force water past their gills. Swimming around at all depths, there are at least a couple of turtles here, one of which doesn’t have all of her flippers. Like the Leopard Sharks, they’re very easy to approach, but this isn’t fair on the animals or the next group of divers to come along, because the only result is the turtle or shark swimming off into the distance or depths for some peace and quiet. There are plenty of reef fish here, as well as a number of schooling and pelagic species. All in all, it’s a great dive site, and one that Koh Lanta diving boats often visit on day trips as well as liveaboard cruises. The sea conditions are normally ideal, it’s not too difficult for new and inexperienced divers, but also not too easy and/or boring for those who have experience and want to see something good. Koh Lanta liveaboard diving boats are also in the favourable position of being able to dive here at any time of day or night, whereas the local boats usually crowd the site at lunchtime.